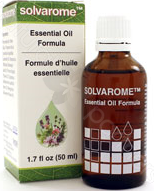 Place 40-50 drops of Solvarome in Shampoo and wash hair as n ormal (hair will need to be washed daily). After washing apply a few drops to hands and work through the hair and leave in. You will also need to meticulously go through the hair with a special nit comb to remove eggs. This step will also be repeated daily. Until no reoccurrence or lice or nits can be seen. Not only will you need to treat each infected child/person, but any soft surfaces that they have come in contact with. This includes bedding, clothing, stuffed animals, furniture, even curtains. We recommend that items be washed in hot soapy water. If items cannot be washed in hot water it is recommended that you thoroughly vacuum the item to remove any lice and/or loose nits. Any items that cannot be treated in either of these manners it is recommend to place them into sealed plastic bags for a few weeks. We also recommend that you check everyone in the family as lice spread very easily. Lice have a short life cycle making it very important to begin treating as soon as you notice an issue. It takes 7 to 10 days for a nit (egg) to hatch and another 7 to 10 days to reach full maturity and begin to lay more nits. The sooner you begin treatment the less lice you will have to get rid of. It is best to k eep your infected child(ren) home while you are treating for lice to avoid infecting others.